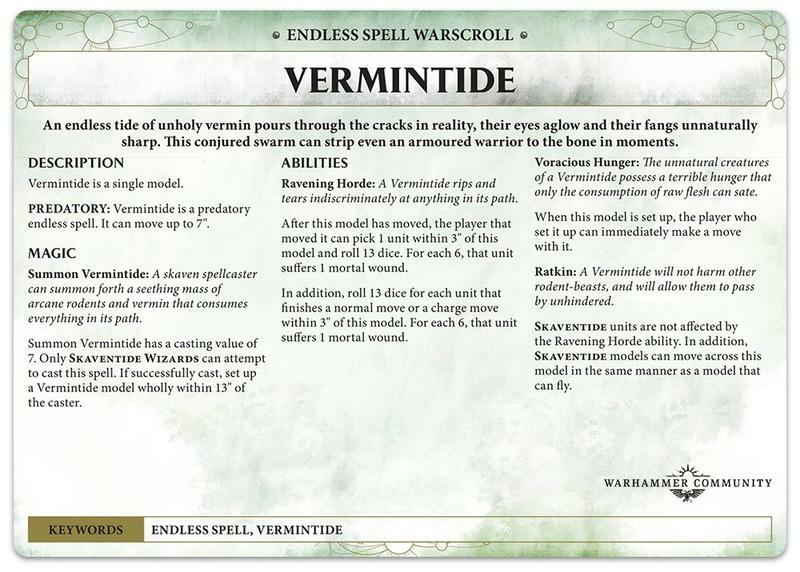 Didn't expect to be back so soon, but GW is throwing spoilers at us hard and fast and you know i'll be there to catch them. 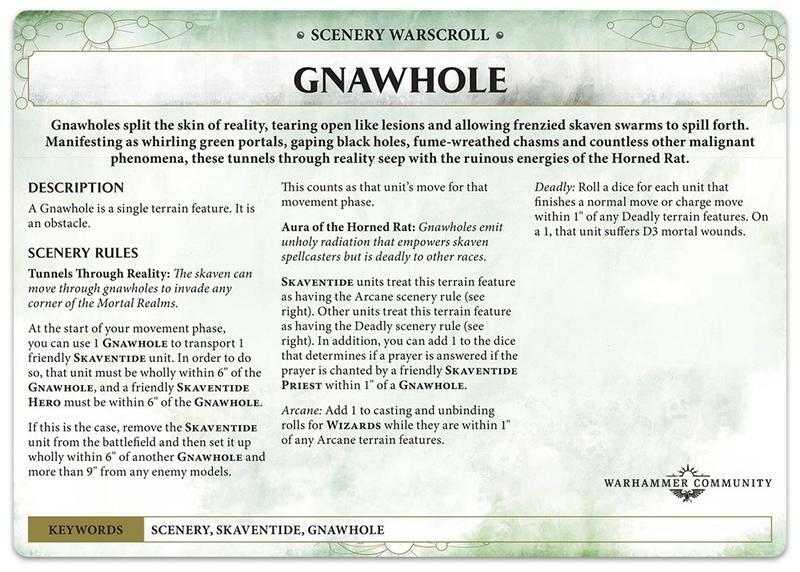 Today's article centred on Skaventide Endless Spells, as well as the Gnawhole terrain feature. As always, I preface this saying we don't have the full picture, any of my predictions could be wrong here based entirely on what we get caster wise and what's big in your local meta. We also don't know the point costs of these (Gnawhole is terrain and therefore free) so that can be a factor. Lets get stuck in with Vermintide. More than just a fantastic video game series, "Vermintide" makes a triumphant return to form from it's glory days in Fantasy Battle and Total War Warhammer, and it's somewhat less glorious days as the Grey Seer unique spell. This thing got an upgrade to say the least, it's a predatory endless spell that can't harm it's own army or even body-block them. The thing is on an enormous base too, so everything about this thing screams choke point blocker. Also it will squeeze out maybe 3 or so mortal wounds on anything that dares to bump and grind against it, nice. At first this was my least favorite, due to it's high casting roll and pseudo Geminids-but-not-as-good deployment. Then after seeing the casting buffs we will have access to in addition to the ones we already have, I changed my mind. The damage on this thing isn't it's draw, though it definitely has potential. The real devil is in the details however. Notice how this doesn't actually fly. Now notice it strips the ability to fly off enemy units. But Aiden, Pestilent Lord of all that Rots, how could that be a good thing when it's immobile? THIS THING IS SOULSNARE SHACKLES BUT IT CAN STOP FLYING MODELS. Cya Bloodthirster. Stop right there Ironclad. Morathi? I hardly knew ye (she will probably just unbind it but still). Worth it. Oh hey you. Now a good parent doesn't play favorites, but I never claimed to be the best. This thing, this prodigal son, this apple of the eye of Skreech Verminking himself. It's crown of conquest at 13 inch range and it flies around the table and ONLY BENEFITS US. Oh but the enemy can take it and move it you say. Well yes they can, but good luck getting it away from everything in our army when it doesn't specify wholly within. Not much more to say, love it. Tunnel Through Reality is fine. It's more going to be useful for moving heroes than units due to the wholly within caveat but that's fine, it does what it needs to do. Aura of the Horned Rat however is quite toasty, free arcane terrain is amazing in an army that (historically) has few actual buffs to cast. It will pair well with Grey Seers and their ability to reroll failed casts to say the least. Also while Deadly isn't the slaughterhouse it used to be, it will be worth keeping note of as a fun extra way of chipping out extra damage. See you all in the next episode, it will probably be next week knowing GW. Then again we also have LVO reveals in less than 24 hours, not that I think anything is coming that will affect us too much. As always, let me know your thoughts and let's get a discussion going. The first few steps in making the skaven race great again. Rise-scurry my children the time has come!!! 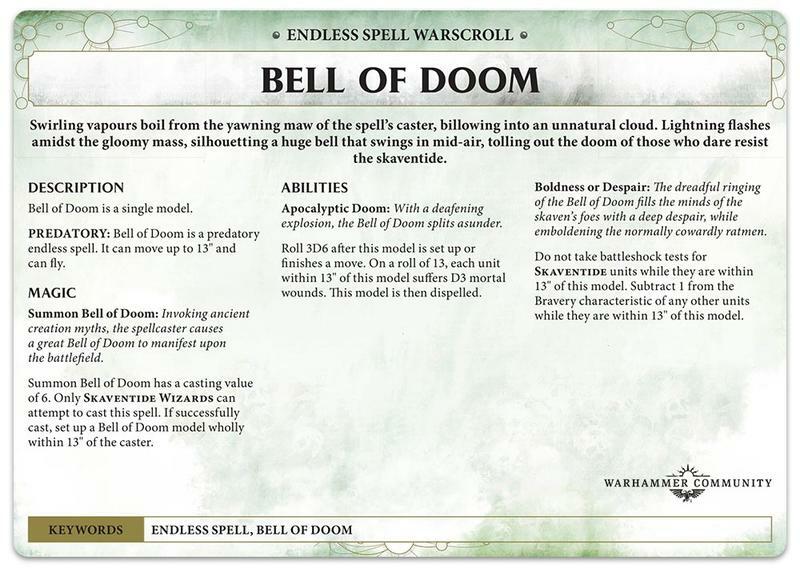 The bell of doom is rather fantastic. its probably one of a few spell or abilities that only wants a unit within 13 and not wholy within to get the battleshock immunity. 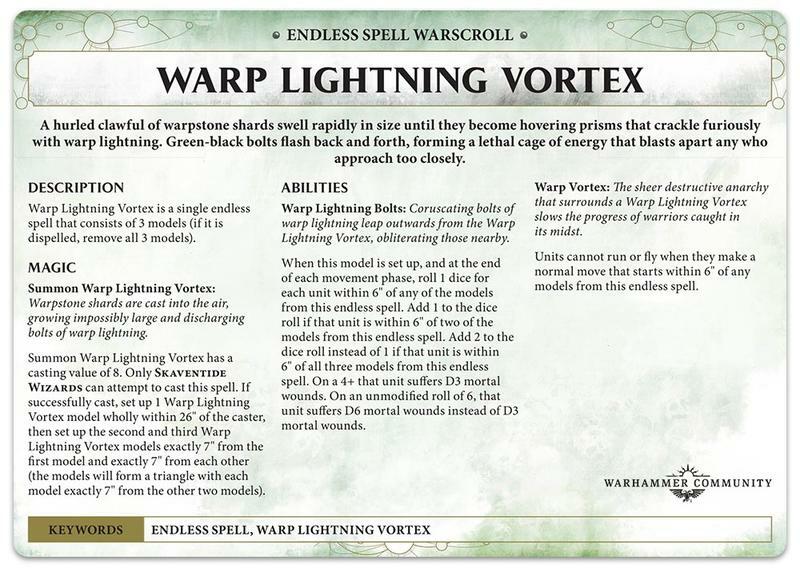 rather crazy for a aos 2.0 battletome. The new warscrolls are in app under skaventide.